OHSAA Commissioner Dr. Dan Ross, Cole Gilliland, and Southeast Ohio District Athletic Board member Tony Mantell stand together after Riehl was awarded a $500 scholarship from the SEODAB. Throughout the course of his high school career, Clay’s Cole Gilliland did so many good things on and off of the playing field that one would only need eight words to describe him — a young man who takes care of business. Sure enough, the 6-4 student-athlete did that time and time again en route to representing Clay High School in the highest of orders. In the process, Gilliland put himself, and helped put the Panthers, on the map. 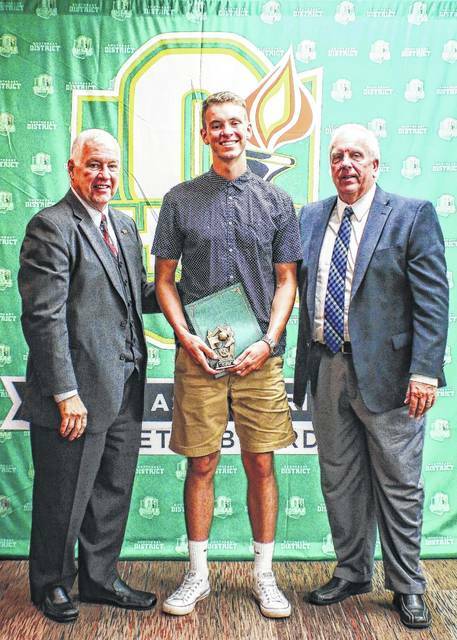 The three-time All-Southeast District basketball honoree and class valedictorian — who signed with Kentucky Christian to play college basketball in the fall — added another accomplishment to his ever-growing list when the accomplished high school graduate received a $500 scholarship from the Southeast Ohio District Athletic Board (SEODAB) for his excellence as a student-athlete at Clay High School. For Gilliland, receiving such a scholarship is a blessing considering the amount of effort that went into achieving the lofty goals that the senior had set for himself. Over the course of the year, Gilliland’s success, as known by many around the area, was wide-ranging. In addition to collecting three consecutive All-Southeast District honors as one of Clay’s strongholds on the basketball side, the senior added an All-District accolade in baseball and led the Clay basketball unit to its first Division IV District Championship and its first regional appearance since 1969 as Gilliland helped lead the Panthers to a 24-3 record. The dynamite student-athlete then led the Clay baseball program to 12 victories in its final 17 affairs in 2017 as the Panthers advanced to the Division IV, Southeast I District Semifinals. However, even though Gilliland finished his athletic career as one of the most accomplished athletes in the history of the Clay athletic program, his wide array of academic achievements are arguably even more impressive. Behind his perfect 4.0 grade-point-average, Gilliland not only patrolled the glass and the infield for Clay athletically, but patrolled the entire 2017 class academically en route to earning Wendy’s High School Heisman honors, the Glockner Family Scholarship, and WSAZ Best of the Class accolades after being named as the school’s valedictorian for 2017 to keep it in the family. However, no matter where the genes came from, it didn’t come without sacrifice or determination from the standout student-athlete. With his high school journey complete, Gilliland will prepare for his newest journey at KCU, a small, but tight-knit university of just over 600 students. There, Gilliland wants to obtain a bachelor’s degree in business, excel in basketball, and most importantly, continue to form a bond with Jesus Christ. And as he tries to accomplish all of those goals for himself, Gilliland plans on being a figure that his fellow peers can come to when they need help or guidance — just like he was at Clay.